I just wanted to create a cute and fun toy for simple entertainment. Animated gifs are a popular type of content to share and are found all over the internet. Many gifs share a short video clip of a hilarious or interesting moment. Simply copy your favorite gifs to the SD card, and turn it on! The Pi TV will play each animated gif in an endless slideshow fashion for hours of entertainment! A Raspberry Pi drives a small touch LCD screen via the SPI interface. 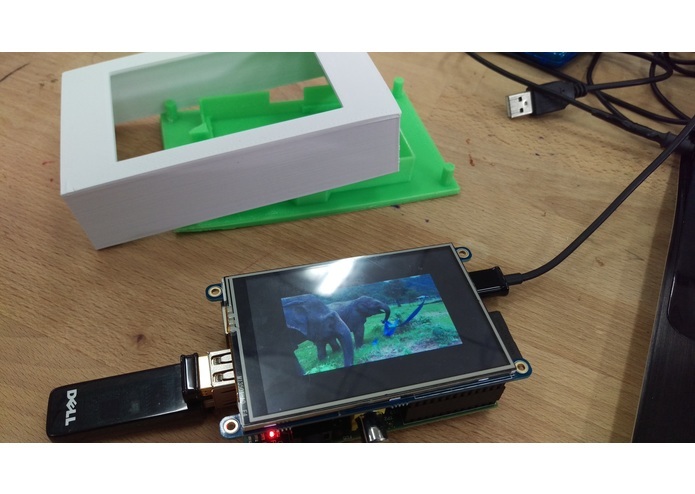 The Raspberry Pi reads gif files found on the SD card, and plays them in full screen mode in an endless slideshow. Mplayer was used for displaying the gif files. A custom 3D enclosure was printed to protect the device. It resembles an old fashioned TV with antenna, and the bright colors make it fun to look at. Designing my first 3D model for printing. I had to learn how to use Tinkercad for my 2-piece enclosure. Multiple print attempts had to be done to get it right. Also displaying the gifs in a clean way was difficult. I had to find the right video player that could display an animated gif, full screen, scale images, and could perform well even on the Raspberry Pi's limited performance. It works! I learned how to use 3D modeling software and use a 3D printer. I learned how to use 3D modeling software and how challenging it is. I also learned how to use a 3D printer and the limitations that come with it. I learned how to use an LCD screen with my Raspberry pi. Make use of the "touch" part of my LCD touch-screen. It could be used to skip the current image or apply an interesting filter to the current image. I could also use the wifi module to download new images in the background. Images would be downloaded and cached on the SD card for better performance.